There's no Bio feature on the back of this week's WLS survey. Instead, the station turns back the clock six months - which happened to be Dad's 32nd birthday - for a Top Ten from the Past. My best guess is that I had maybe four of the Forty-fives listed as of the list's May date but by November 1978, it is highly likely that I had added two more of the singles to my growing stash. The lyrics featured on the back of this week's survey in the Etcetera, Etc. portion are for Foreigner's "Hot Blooded", down two clicks this week to number 7. 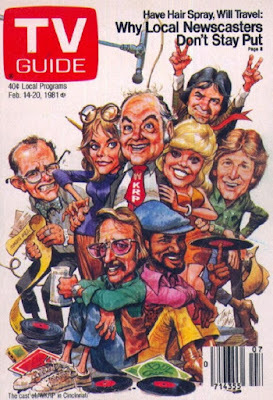 The song would be featured in the tenth episode of WKRP in Cincinnati's first season as Les Nessman prepares for "A Date With Jennifer". When that season was originally released on DVD in 2007, "Hot Blooded" and other songs originally heard when the series first aired were conspicuously missing. Fortunately, Shout! Factory reached out, paid up and secured the rights to all but a handful of the original songs making things right again in this fan's world. The three debuting singles on this week's Forty-fives chart are from The Rolling Stones, Ambrosia, and Foreigner. The Stones "Beast Of Burden", one of their two singles on this week's sheet, comes in at number 44 on its way up to number 29 in a brief nine-week stay on the list. "How Much I Feel" makes it in at number 41; five weeks later, the future soft rock classic would peak at number 8. Up at number 38, Foreigner's "Double Vision" was one of two singles by the group on this week's list of Forty-fives. The single would top out at number 9 in a five-month stay on the station's weekly surveys. In the midst of a 30-week chart life, "Hot Blooded" falls two places to number 7 this week, having peaked at number 3 back at the end of September. 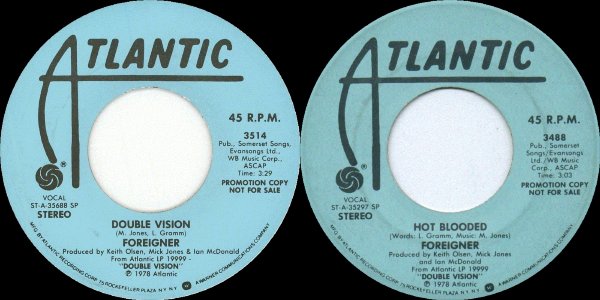 Both "Double Vision" and "Hot Blooded" 45s are edited from their album versions, with more than a minute cut from the latter and a whopping 11 seconds lopped off the former. 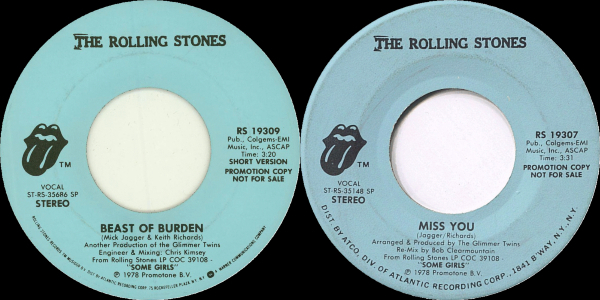 Like the Foreigner singles above, "Beast Of Burden" and "Miss You" are edits of longer album cuts with the latter actually a 3:31 Re-Mix taken from the original eight and a half minute recording of the song, which features extra lyrics and guitar lines that did not find their way onto either the 45 or album versions. "Miss You" is a former Number One song on the Forty-fives list that would spend more than half a year on the WLS singles chart. 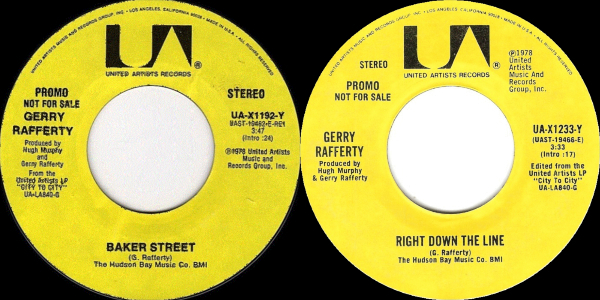 Gerry Rafferty also has two singles on the list of Forty-fives this week, both from his album City To City. "Baker Street" is anchoring the list at number 45 for a second consecutive week, having peaked at number 4 back in July while "Right Down The Line" moves up three spots to number 26 on its way to a high at number 19. 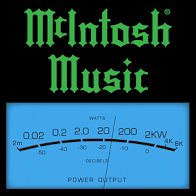 Both singles feature edits of their respective album versions which are off-putting to listen to after forty years of hearing the longer versions. 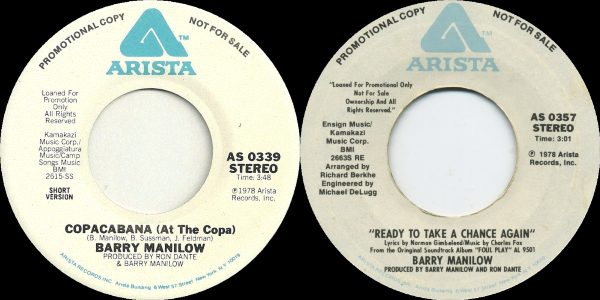 Dropping five places from number 37 to number 42 is Barry Manilow's "Copacabana (At The Copa)". 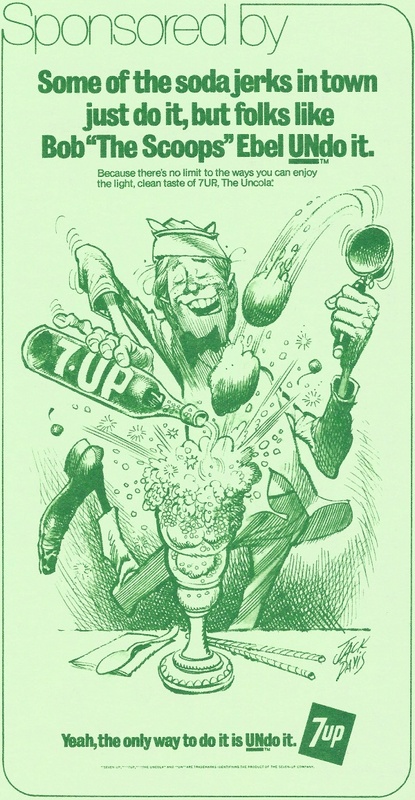 Or, as WLS listed it, "Copa Cabana". Manilow's second 45 on the list this week is "Ready To Take A Chance Again" which moves up eight places this week to number 17. The song is taken from the Foul Play soundtrack. 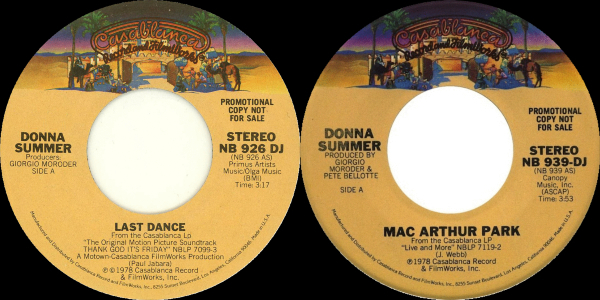 The only female artist with a pair of singles on the WLS singles chart this week is Donna Summer, with two 45s lodged in the half of the list. Jumping seven spots into the Top 10 is Summer's take on Jimmy Webb's "MacArthur Park"; the track would eventually top out at number 2. "Last Dance" is holding at number 24 for a second consecutive week twenty places below the single's peak back in July. The single is from the Thank God It's Friday soundtrack and Donna Summer actually performs it onscreen. The four singles pictured above are all from the Grease soundtrack album, a former long-running Number One on the Thirty-threes chart. 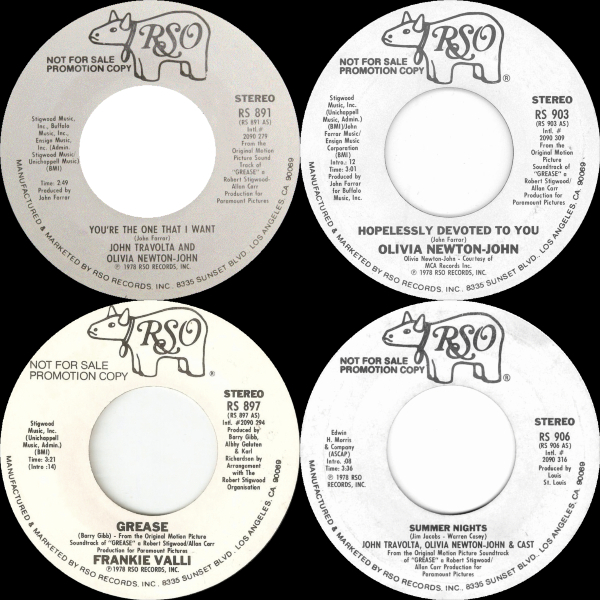 They give John Travolta two singles on the Forty-fives and Olivia Newton-John three of them. In a break from all of the other 45s in this post, all four of these singles are unedited album cuts. 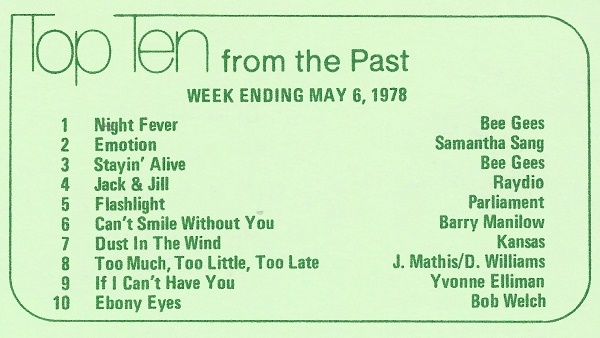 In addition to the soundtrack singles "Last Dance", "Ready To Take A Chance Again" as well as the four from Grease, there is another 45 on the singles list taken from a motion picture soundtrack: Earth, Wind & Fire's "Got To Get You Into My Life", quite possibly the lone bright spot on the Sgt. Pepper's Lonely Hearts Club Band album. Maurice White's brilliant arrangement of The Beatles tune falls two places to number 34 this week after peaking at number 17 back in September. 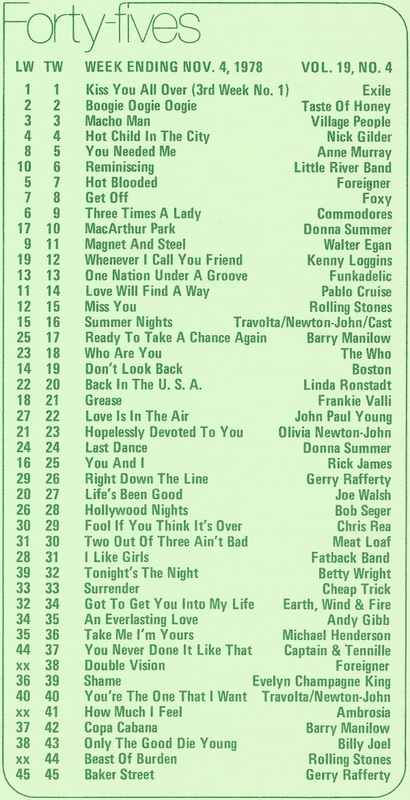 While I have no memory of ever hearing the tracks at numbers 36, 32 and 31 on WLS and had to look them up, this is a solid list of Forty-fives with heavy doses of disco and rock I love to this day. At least 30 of these songs are in the running for HERC's Ultimate Jukebox, making it even more difficult to choose which singles will make the final cut. NOTE: It wasn't until I returned to this post for one last proofread before scheduling that I noticed the scans of the promo 45s were not MONO which is what WLS would most likely have played. I'll try to do better next time out. Herc, wow - this is a great snapshot from my youth. The songs all bring back memories, and the three TV shows from that week I can tell you I remember watching them all.